The CodeBroker MyOffers Digital Wallet enables you to deploy a fully-branded offer wallet across multiple digital channels, to give your customers instant access to all of your offers and deals all in one convenient place. Give your customers the same offer wallet capabilities as top retailers like Macy’s and Kohls – easily and affordably. Deliver coupons, offers, rewards, and more directly to your MyOffers Wallet, giving customers an easy way to organize and track all of your offers – and giving you the ability to send new, and update existing offers. Customers can access your MyOffers Wallet from a range of digital channels, including text message, mobile app, email, website, Apple Wallet and Google Pay. Get A Variety Of Offers Into Your Customers’ Hands. The CodeBroker MyOffers Wallet lets you deliver a broad range of content directly to your customers’ phones to enhance customer satisfaction and increase shopping frequency and lifetime value. The CodeBroker MyOffers Wallet gives your marketing team a modern and effective new marketing channel that appeals to today’s consumers – especially millennials. It’s the ideal complement to your mobile marketing strategy, to help you deliver a stronger customer engagement experience that’s designed to drive purchases. Extend the functionality of the MyOffers Wallet with CodeBroker's coupon clearing API's. These API's are designed to make it easy to issue and redeem single-use coupons via your POS. If you don't yet have the ability to use single-use coupons, CodeBroker offers a scalable, flexible, easy-to-integrate solution that works with seamlessly with your existing infrastructure. Easy to launch solution gets you up and running quickly. Deliver personalized shopping recommendations and offers. Send offers and allow customers to access them via multiple digital channels. Connect to your CRM to leverage customer profiles and create personalized offers. Send millions of personalized mobile coupons daily. Track engagement in real time. Provide complete access to your loyalty program via digital and mobile channels. Real-time API's allow you to accept single-use coupons. Every consumer has his or her preferred way to receive offers, and the CodeBroker MyOffers Wallet gives you numerous ways to deliver offers to your customers. You can use the MyOffers Control Center to send offers directly to each customer’s wallet and then send alerts and reminders about these new offers via multiple digital channels, such as text, in-app push, and email. To promote engagement and action, customers can choose the channels they wish to use to receive messages and access offers. The MyOffers Wallet is integrated with CodeBroker’s text and coupon marketing platforms, and its real-time reporting solution to give you powerful capabilities for delivering offers, driving sales, and monitoring engagement. The MyOffers Wallet provides enterprise-level mobile coupon marketing capabilities that enable you to send millions of unique mobile coupons daily directly to customers’ MyOffers Wallet, each personalized based on the customer’s preferences and shopping history. CodeBroker is the only solution that lets you generate a “smart” single-use mobile coupon with a security model that ensures that once the coupon is used, it expires and is marked as redeemed across all channels to prevent re-use. CodeBroker provides advanced, enterprise-class SMS marketing capabilities that let you send millions of text messages daily, to appeal to consumers who prefer to receive offers via text message. Deliver coupons and offers that customers can download into your MyOffers Wallet by simply clicking on a text link. CodeBroker’s retail customers have found that mobile coupons tied to an SMS campaign deliver redemption rates that substantially exceed industry averages. It's easy to integrate CodeBroker's MyOffers Wallet into your existing mobile app. Quickly give your app the ability to present offers and rewards, enable your customers to request on-demand offers and to search your available offers. Give yourself the ability to easily control and personalize what offers your customers see in your app. The Myoffers Wallet offers a secure solution to enhance your mobile app engagement and which can be integrated in just a couple of days and requires no SDK's. Consumers love Apple Wallet and Google Pay, but they present limitations for marketers because consumers have complete control over what goes in their wallet. Marketers can’t directly push new offers or rewards into them, limiting your promotional opportunities. CodeBroker removes this limitation because the customers can add the MyOffers Wallet right into their Apple and Google Pay wallets with just one click, giving customers access all your offers right from the Apple and Google wallets – and giving you unprecedented control to send new offers, remove offers, and update existing offers – for a powerful new world of promotional capabilities. CodeBroker's powerful real-time reporting engine enables you to see your customers' engagement in real-time: Watch engagement by mobile channel. See which promotional activities are impacting engagement. View trends over time. Use report results to drive future promotions. 69% of consumers prefer to store coupons on their mobile phones rather than print them. 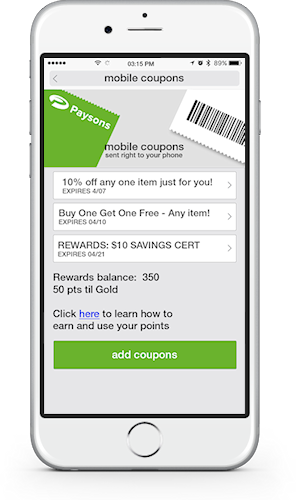 60% of consumers redeem mobile coupons delivered via SMS within one week. 57% prefer to receive via a text message link. Take your loyalty program to the next level by giving customers complete access to their rewards, offers, points balance, and more right from their MyOffers Wallet. Member Acquisition - Enroll customers into your loyalty program in mere seconds, on their phones, and automatically connect their records to your loyalty management system. Mobile Loyalty Card - Give customers a way to display their loyalty barcode at any time. Rewards Access - Make it easy for customers to quickly access and monitor their loyalty rewards. Engagement - Notify customers when they have new rewards available. 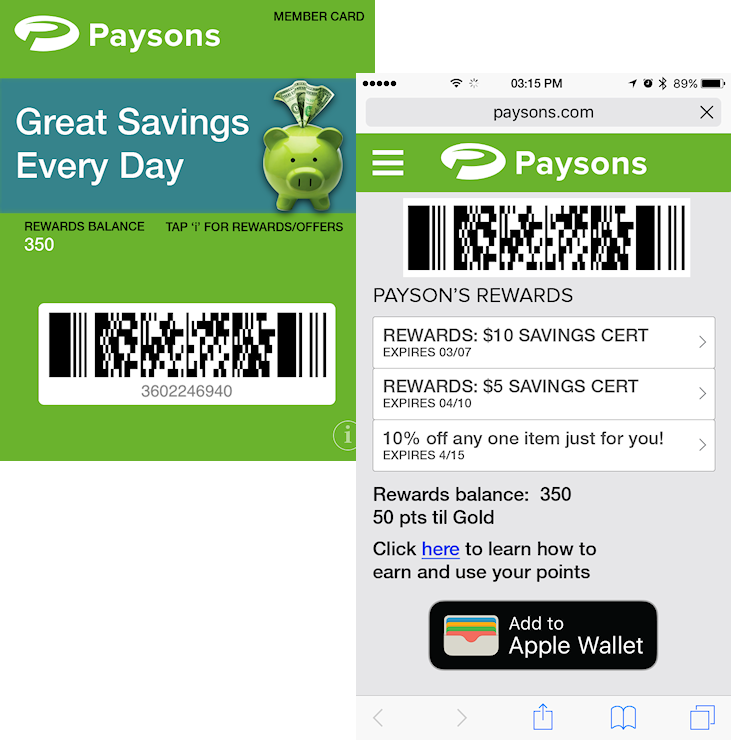 Update mobile loyalty cards in real-time and send notifications. Deliver personalized shopping recommendations and deals to your customers based on their shopping preferences directly to your MyOffers Wallet to drive repeat purchases and loyalty. CodeBroker’s MyOffers Wallet complements your existing digital marketing strategy, and creates an even bigger footprint on your customers' mobile phone. It’s easy to set up your MyOffers wallet and CodeBroker’s team works with you to ensure its success. Contact CodeBroker today to learn how to put a branded MyOffers Wallet to work for your sales and marketing programs.